LOS ANGELES - Ted Williams, the Ohio homeless man whose smooth radio voice made him an Internet sensation, had to do some quick talking to Los Angeles police. Officers were called when Williams and his daughter got into a heated argument Monday night at the Renaissance Hollywood Hotel & Spa, Officer Catherine Massey said. "I don't know how loud they were" but the argument at about 9 p.m. led to a disturbance report, Massey said Tuesday. "It was minor. Both parties were angry but there were no signs of visible abuse," Massey said. "They were brought in, calmed down, talked to and released." She said she did not know the nature of the argument. She declined to name Williams' daughter, but a statement from "Entertainment Tonight" identified her as Jemay Williams and said the two would discuss the incident in a Tuesday night show. When asked if he had unresolved anger issues toward his daughter, Williams told "The Insider" that "the only unresolved anger issues that I have and resentment I have are toward me." Williams said he didn't feel the need to go back to rehab. He told "The Insider" he's still sober. He said he's "truly sorry" for the way he responded and hasn't addressed any of issues between him and his daughter. Williams and his daughter were held at the Hollywood police station for less than an hour and they were not arrested, Massey said. It was not known whether the two returned to the hotel after the incident. "Due to guest privacy laws, we don't share details of our guests or their stays," said Dan Shaughnessy, director of sales and marketing for the Renaissance. Williams' manager, Al Battle, declined to comment about or provide details of the incident but said a statement would be issued soon. "Once we get all the facts, it'll be out there for everybody to have," he said in a brief phone interview with The Associated Press. Williams had traveled to Los Angeles for several television appearances, reports the Los Angeles Times. Earlier on the day of his arrest, he mingled with members of basketball's Los Angeles Lakers. "It was good. It was the first time," Kobe Bryant told The Times' sports blog. "I had never seen him before, but I had heard a lot about him. It was pretty cool." "Entertainment Tonight" covered his meeting with voiceover actors at a Screen Actors Guild Foundation sound studio who offered to help Williams become a guild member voiceover artist, according to a show statement. A two-part episode on TV's "Dr. Phil" show was taped during the weekend to air Tuesday and Wednesday. On the Wednesday segment, Williams meets with his ex-wife, Patricia, and five of his nine children, according to a statement from the show. "In this emotional reunion, Williams talks openly with his family about the man he is today, the influences that threaten his sobriety and what his children can expect from him in the future. His children respond in a very raw and candid manner," the statement said. "Everyone is pulling for Ted, but his 15 minutes are going to be over and then he'll be left to manage a life filled with temptation," host Phil McGraw said. "We're going to try and help him prepare for that because it would be a real tragedy if he did not make the most of this extraordinary second chance." 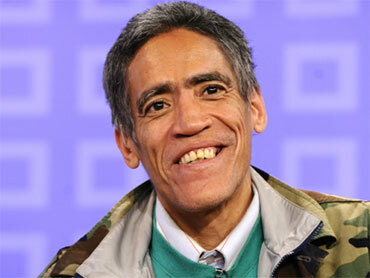 Williams, 53, trained to be a radio announcer but found his life derailed by drugs and alcohol in the 1990s. He has served time in prison for theft and forgery and has been cited with numerous misdemeanors, including drug abuse. Williams became famous almost overnight after The Columbus Dispatch newspaper posted a web video of him last week. Viewers were enthralled to hear a deep, honeyed professional voice coming from the shabbily dressed man. Since then, he has done a TV commercial for Kraft Macaroni & Cheese, appeared on various news shows, recorded voiceover promos for cable news and was offered an announcing job with the Cleveland Cavaliers basketball team. Although he says he has been clean for more than two years, the recovering addict has acknowledged that it has been challenging dealing with sudden fame. "I wanted a nerve pill yesterday, to be honest with you," he told CBS' "The Early Show" Friday.